Slackline Access – Slackline U.S. In many places, such as Boston, MA, and many smaller cities, slacklining is unrestricted. In these locations, local communities have often developed good relationships with the city and park officials and have never or rarely been prohibited from slacklining on public land. In some places, including Jackson, WY and San Luis Obispo, CA, slacklining is officially allowed through negotiations with city officials and the addition of municipal code specifically allowing the activity. Often this approval comes with regulations. Slacklining in Parks: Regulations for Jackson, WY posted at the park entrances. Photo: Ken Wagers. In some cases, those regulations are quite reasonable (see Jackson regulations photo or Boise regulations below). In other cases, slackline regulations require permits and limit the height of a slackline to as low as 2 feet. Depending on the distances of the lines available, the 2 foot limit can actually be less safe and cause potentially more stress on the trees as it requires slacklines to be set at higher tensions to remain off the ground. Across the U.S., many slackliners report slackline access issues in city parks and other public lands. In many cases, city and park officials, unfamiliar with slacklining, believe that it is a liability concern or that attaching slacklines may damage trees. Most municipal codes do not directly reference slacklining, neither allowing or disallowing the activity. Instead, when citations are issued, the violation cited is often one prohibiting the attachment of anything to any tree, post, bench or other structure. Example from Santa Monica, CA Municipal Code 7.40.140(c): No person, without the approval of the Director, shall attach or keep attached any wire, rope, swing, or any other object to any public tree. In this case, the wording suggests a path to allowing slacklining through approval of the director. However, even if the wording were less flexible, slacklining can often be made legal through communication with the city and park officials. Materials that may support such efforts can be found in our Publications. Max tension should be less than the Working Load Limit (WLL) of the weakest piece of gear in the system (See Tension Calculator). Back up tricklines and longlines by tying the tail of the webbing around the tree, sling a ratchet back to the tree with a piece of rope, etc. Be aware of spectators, especially while longlining. Never longline alone; friends can watch for approaching spectators, chat with them, prevent curious people from touching the line. Tip: Demonstrate competence. When tricklining or longlining in the park, be aware of the surroundings. If a park or city official is observing, having an experienced slackliner performing confidently while being observed can go a long ways to easing concerns about safety. If a longline or trickline is rigged with only beginners practicing and observers consistently see people falling, they may be more likely to report a concern about slacklining safety and liability. Be able to answer questions about tensions, backups, the materials used in your slackline as demonstrating this knowledge will also help appease concerns. Most policies include basic guidelines: Slacklines cannot cross paths, roads, or walkways; cannot be left unattended; and shall be attached only to trees or designated slackline posts installed for the purpose. Some policies are listed here. A comprehensive list is being compiled currently. Feel free to submit policies you are aware of to us on our Facebook or through our contact page. Please always follow Leave No Trace (LNT) ethics to minimize your impact on a slackline or highline location and help maintain access to public lands. 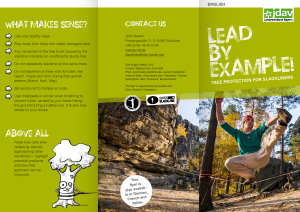 (Updated March 6, 2016) – Max length = 100 ft, Max height = 6 ft. Photo ID Slackline Permit required. Tree protection and required. Trees must be 12″ in diameter, but cannot be “Heritage Trees.” See regulations for more details. (Updated August 19, 2016) – Max length = 80 ft, Max height = 30 inches. Tree protection required. ‘Use only nylon webbing’ (?). Spotters required. Mark lines with bright wind dampeners. 2 Hour time limit. No more than 3 lines in an area together. More lines must be 100 yards away. (Updated February 10, 2017) – Slacklining is allowed on designated trees in designated parks. A map is available online showing these trees and park locations. No length limitation, though lines over 50 ft in length must have wind dampeners to increase visibility. The slackline may not be elevated to a height of more than 4 feet at the center of the span when the user is on the line and weighting it. Tree protection required. See details on the Boulder CO website. (Updated August 19, 2016) – Tree minimum 8 inch diameter. Max height = 3 ft. Troops require permission for slackline events as it is considered an ‘adventure’ activity. (Updated April 18, 2017) -There have been some concerns about highline access at Ortega Falls (Cleveland National Forest / Lake Elsinore, California, USA) after recent media coverage. Slackline U.S. reached out to Cleveland National Forest and helped to coordinate an event with the rangers and local slackliners to demonstrate highlining, explain the rigging, and host a clean up in the area. At the same time, aged bolts were replaced with new glue in bolts. Moving forward, highlining is allowed at Ortega falls and no permits or other special permission is needed. No new bolts should be added, however. (Updated March 6, 2016) – Slacklines are not allowed in campgrounds. Slacklines must not be rigged on Joshua Trees. Highlining is allowed when lines are anchored in rock. Bolting is allowed, though bolting new lines may require a permit depending on the area. Contact park officials for more information. 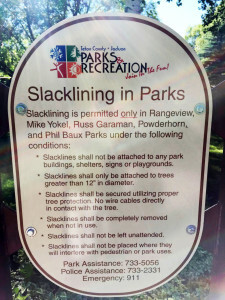 (Updated August 19, 2016) – Slacklining currently prohibited in all city parks with the exception of designated areas of Swanny Park. More info here. (Updated August 19, 2016) – Max length = 80 ft, Max height = not listed. Tree diameter minimum = 1 ft. Trees may not be climbed to affix anchors (see acrobatics Two-High as an alternative). Local SF Slackers group on Facebook recently attended a Recreation and Park Commission meeting to make the case for longer lines using the Slackline U.S. Access to Public Lands document and the International Slackline Association‘s Longline Recommendations document to support their case. Decision is pending, but hopeful. (Updated March 6, 2016) – Slacklines are not allowed in the picnic and camping areas. Highlining is allowed and many lines have been previously established, though recent rules place a moratorium on new lines while impact studies are conducted. Lines cannot be left up overnight or unattended. If left so, lines may be removed by the park. Smith Rock has recently expressed increase concern about the impact highliners have on the environment as the sport grows. If you are highlining at Smith Rock, please be especially careful to follow Leave No Trace ethics and minimize your impact. In general, access management is about communication and conservation. Read the guidelines in the Enriching Public Spaces flier for suggestions. Additionally, a Proposed City Ordinance is provided which is easily modified to address your City’s specific concerns. Slacklining is only allowed on designated trees. Please see the interactive map online to identify the approved trees. Slacklining is only permitted during park hours. Participants and spectators assume all risk associated with the activity. All slacklines may be affixed on a temporary basis and may not be left unattended. Unattended equipment will be removed and considered abandoned property. Tree protection material must be placed between the tree and the line that is fixed to the tree. Material must be at least ¼” inch thick and at no time should any cabling, wires or lines be in direct contact with the bark of the tree. The slackline may not be elevated to a height of more than four feet at the center of the span when the user is on the line and weighting it. The slackline may not obstruct the intended uses of the park, sidewalks, buildings, roads, streets, playgrounds, bikeways, water features, sport courts, bike racks, handrails, art objects, fences or light poles. Trees and/or landscaped areas showing damage from slacklining activities may be restricted. Slacklines may only be attached to approved trees and may not be affixed to any other infrastructure including but not limited to buildings, bike racks, handrails, art objects, fences or light poles. Activities such as stunts or tricks involving flips are not permitted. 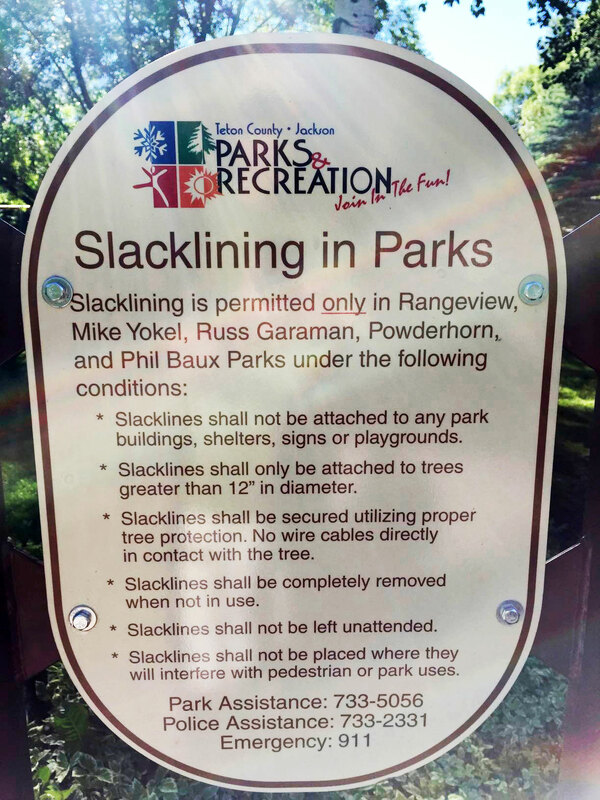 Slacklines must be removed for any park permit use or regular maintenance such as lawn mowing or tree pruning.